*New players only, 18+. Min 1st deposit £10; Spins depending on dep. amount, valid for 24 hours on exclusive slots. Max winnings £10; Full T&Cs apply. King Jack has a lush, royal purple theme housing an extensive collection of slot games, some of which are exclusive, from a both solid and eclectic team of software providers. Live dealers are also here, but this isn’t really the place for serious table games. All the details in our King Jack Casino review. For the first bonus, every £10 deposit will get you 10 spins, so if you make a £30 deposit, you’ll get the maximum 30. The spins are for King Jack’s exclusive games and you’ll have more than 30 titles to choose from. All of the 3 bonuses have a minimum deposit of £10, and they are all valid for 7 days. The spins have no wagering requirements, which is always good news for slot players. What you win with them goes directly into your cash balance. The second and third bonuses are rather average with wagering requirements on a touch on the high end, since they’re on the bonus plus deposit. That having been said, they’re still great for trying all the games. As long as you don’t expect to walk home with a wad of cash from these funds, you’ll have a fine time. If you’re looking for the royal treatment, then King Jack’s promos has lots pamper you with. There are all sorts of lucky draws with cash prizes, like the £50k Cash Drop and the £1,000 Cash Draw specials. Daily, weekly, monthly offers are all part of the programme here. Then you get loyalty points for every game you play and you can then exchange the gifts for bonuses or even real world prizes! King Jack is big on reels, and they even boast some exclusive slots designed by Dagacube. Check out Spin 4 Cash, which is a Wheel of Fortune with multipliers and two progressive jackpots. Of course, there are also popular UK slots here. Novomatic’s Gangster Paradise and Book of Ra are good choices, as are the top performing Microgaming and NetEnt releases. You can sort through the slots according to their special features such as Jackpot Slots, Tumbling Reels or Stacked Wilds, or just by the number of paylines available. The Live Casino here is all about Blackjack and Roulette, and while there are scratchcards and the odd video poker game here it’s all lumped under the “All Games” tab. You can use Paysafe, PayPal, Neteller, plus credit and debit cards to make a deposit into your King Jack account. Minimum deposit is £10, unless you’re using PayPal or Neteller, in which case it’s £20. Withdrawals have a 72 hour pending period before they get approved. Once it’s approved you’ll receive your money instantly if you’re using PayPal or Neteller. If you’re withdrawing to a card it’ll take another 3 to 5 days. When it comes to banking, King Jack UK isn’t rolling out the red carpet for anyone and the pending period for cash out is going to feel long. King Jack is active on Facebook. Often, they’ll post about their winning players, new promotions, game releases, casino news, as well as posts for just chewing the fat. They’re also on Twitter although they aren’t nearly as active there. On the King Jack site itself, you can always go for a Live Dealer game for some social interaction but beyond that there isn’t a whole lot of chit chatting happening here. King Jack Mobile has the same luscious purple design as on the desktop casino, hosting the same array of games. The mobile slot collection here is first class and the games play speedily smooth. It all works from King Jack’s mobile site which you can access from your phone or tablet’s browser, just like with any other web site. As it’s just a site, it works across iOS, Android and Windows devices. For the moment, there is no separate King Jack app to download, but you won’t miss it with such a beautiful site. 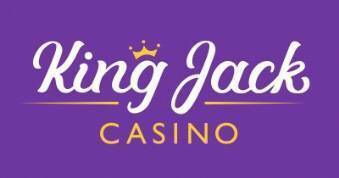 King Jack is an online slot site geared towards UK players. The collection is impressive with games from the usual NetEnt and Microgaming favourites, along with Novomatic, IGT and more eclectic providers. For those looking for some alternative reels, there are also exclusive slots from Dagacube. But, we do have to say the banking process is slow with the 72 hour pending period. This isn’t so far off from the industry standard, but it certainly not royal treatment and we’re going to knock off some stars for this. We give King Jack a 3.5 rating. If you’re looking for some niche slot games, King Jack may just be your next treasure trove! If you’ve played at King Jack Casino, now’s the time to let us and other players how you liked it! Avoid – confiscated my winnings and refused to honour the bonus I’d signed up for. Terrible slots, wins are ridiculously low compared to the amount you wager – you don’t even get half what you bet. Bonus spins are good for wins, but they are very rare. Not really a great choice of slots to play. Quite a boring site, so if you haven’t signed up already save yourself the bother and find somewhere better to play as I will be doing. Please do not waste your time using this online casino unless you have every intention on speaking to their useless customer service team everyday while you deposit. The girls there seem nice dont get me wrong, but can they get you your money? God only knows!